How could this be? This can't be true. Lucy is ten months old. 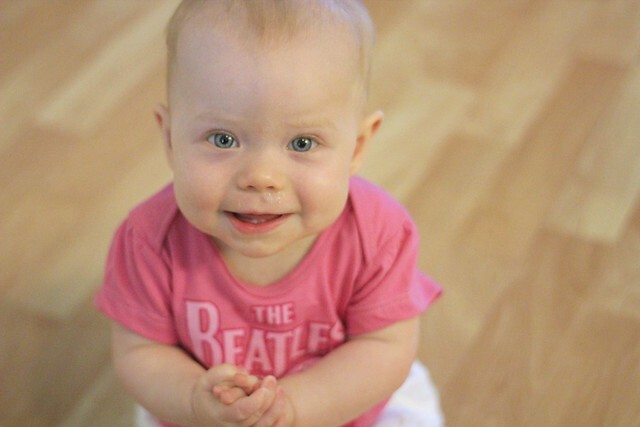 She is just two short months away from her first birthday and I refuse to believe it. My baby girl cannot be this old!! I won't allow it. I attempted to take some 10 month photos of her at our home this past weekend, but something funky was happening with my camera and all of the shots are very noisy and blurry. I am not happy with them. 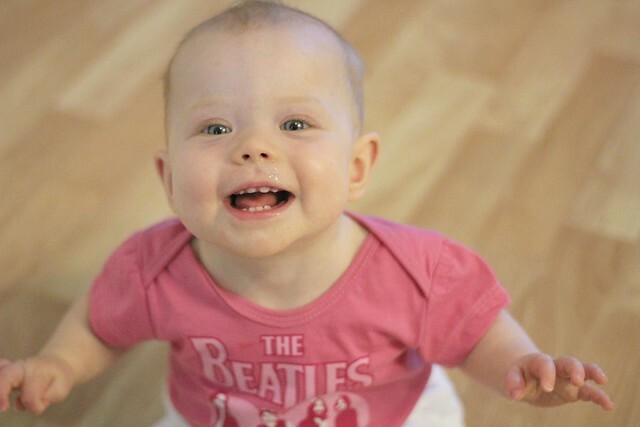 But I am happy with the smiling adorable little girl IN the photos, especially in her new Beatles onesie from cousin Erin! It is nearly impossible to take a photo of Lucy without capturing a runny nose. I swear she had 3 whole days without one last week. But now both she and her brother are dealing with an awful summer cold and we have TWO runny noses in our house. Luckily Benjamin knows how to wipe his own nose.